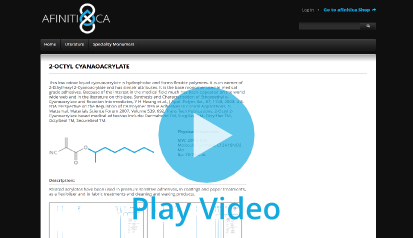 As experts in the field, and with the ambition of becoming the company of reference in the world for cyanoacrylate-based technologies, AFINITICA has created the largest open library dedicated to cyanoacrylates. You will be able to search thousands of articles and patents, and you will have access to spectral and physical information about cyanoacrylate monomers and their corresponding polymers. The extent of information and knowledge that exists in the world of cyanoacrylate (CA) technology is vast and would require a monumental effort to collect. We strongly believe that sharing the information we possess is a starting point to promote collaboration and synergy and unite a community of enthusiasts who can generate knowledge and contribute to great advancements in this fascinating and commercially valuable area of applied polymer technology.